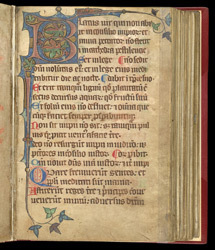 The clergy, brothers and nuns who cared for the impoverished or ill chaplains living at the Hospital of St Giles of Norwich cathedral used this psalter in their daily prayers. Possibly it belonged to the almshouse's Master. It has material for determining hours of daylight (essential to a prayer schedule dependent on sunrise) as well as a calendar (to coordinate prayer with saints' days and feasts), prayers, hymns (some with musical notation) and litanies (a prayer of appeal to God and the saints). Its calendar features the dedication day of the parish church of Norwich as well as later (1460s-1490s) notes of births and deaths of members of Derham and Crimplesham (Crumpilsham) families. The lower margin of a page of the calendar has a sketch of four heraldic arms similar to those over the aisle arcades in the chapel. The psalter represents a quite human and personal link to the middle ages for an institution which still serves its community. the first letter has conventional and relatively modest decoration compared with some late medieval English psalters. It may have been made in a workshop in London, during the time of Prior Nolet (1453-1471).